This talk is based on the paper Square-root cancellation for sums of factorization functions in short intervals over function fields. Thanks to the Institute for Advanced Study for recording this video. Abstract: We study the function field analogue of a classical problem in analytic number theory on the sums of the generalized divisor function in short intervals, in the limit as the degrees of the polynomials go to infinity. As a corollary, we calculate arbitrarily many moments of a certain family of L-functions, in the limit as the conductor goes to infinity. This is done by showing a cohomology vanishing result using a general bound due to Katz and some elementary calculations with polynomials. This method is based on work of Hast and Matei, except that thanks to a trick involving the logarithmic derivative, we are able to achieve a much smaller error term than is possible by this method for a "typical" problem of this type. This talk is based on the paper Bilinear forms with Kloosterman sums and applications with Emmanuel Kowalski and Philippe Michel. Thanks to the Mathematical Sciences Research Institute for recording this video. Abstract: Sums of Kloosterman sums against other functions often arise in analytic number theory problems, but it is difficult to prove bounds when the length of the sum is below the square root of the modulus. In joint work with Emmanuel Kowalski and Philippe Michel, we proved a bound on bilinear forms in Kloosterman sums where the length is just below this range. This has applications to moments of L-values of modular forms and to the level of distribution of Eisenstein series. I will explain this result and discuss possible generalizations. 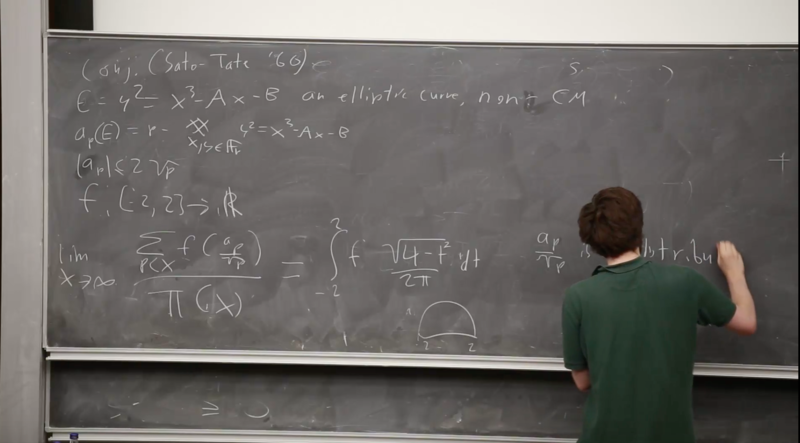 This talk gives a historical overview and then discusses the paper The equidistribution of L-functions of twists by Witt vector Dirichlet characters over function fields. Thanks to the Heilbronn Institute for Mathematical Research and the American Institute of Mathematics for recording and preserving this video. Abstract: The Riemann hypothesis over function fields is a theorem of Weil, with a more general form due to Deligne. This raises the hope of answering more precise questions on the zeroes of L- functions, such as the distribution of the zeroes in a suitable family of L-functions. Powerful results on this have been proved, starting with the book of Katz and Sarnak, but the theory is not yet complete, and it is an area of active research. I will survey the history, explain recent developments, and discuss what is in reach for the future. This talk is based on the paper Ramanujan coverings of graphs with Chris Hall and Doron Puder. Thanks to the Simons Institute for the Theory of Computing for recording this video. Abstract: The breakthrough work of Marcus, Spielman, and Srivastava showed that every bipartite Ramanujan graph has a bipartite Ramanujan double cover. Chris Hall, Doron Puder, and I generalized this to covers of arbitrary degree. I will explain the proof, with emphasis on how group theory and representation theory are useful for this problem. This is an expository talk. A good reference is Exponential sums over finite fields and differential equations over the complex numbers: Some interactions by Nicholas M. Katz. Thanks to the Mathematical Sciences Research Institute for recording this video and overcoming technical difficulties to recover the first 44 minutes. Abstract: I will explain the analogy between trace functions over finite fields defined by exponential sums and certain classical functions on the complex numbers defined by integrals of exponentials. There are close analogies, largely due to Katz, that sometimes allow one to guess results in one domain from results in the other. For instance, many important properties of Kloosterman sums are related to facts about Bessel functions. I will explain some of these correspondences, and how to use them to understand exponential sums. This talk is based on the paper Bilinear forms with Kloosterman sums and applications with Emmanuel Kowalski and Philippe Michel. Thanks to the Institute for Advanced Study for recording this video. Abstract: In joint work with Emmanuel Kowalski and Philippe Michel, we prove two different estimates on sums of coefficients of modular forms---one related to L-functions and another to the level of distribution. A key step in the argument is a careful analysis of vanishing cycles, a tool originally developed by Lefschetz to study the topology of algebraic varieties. We will explain why this is helpful for these problems.